Speaking of tape players in cars, the reason “Hypothetical Love” has made such an impact on me is because it’s a total throwback to when I was a teenager, cruising through high school with hormones blasting out the wazoo (uh, ew), driving to and from school with whatever tape I happened to be adoring at the time blaring from the open windows. And yeah, we’re talking the 1990s, so it was most likely Pavement or Superchunk or something; if I was riding in Banzai Cliff’s car, it would’ve been the Cure, or the Smiths, or Psychedelic Furs, or Echo and the Bunnymen, or any number of excellent “First Wave” acts I can now listen to anytime I want on Sirius, because, again, adult. But Banzai Cliff is of the moment, and their throwback style is reminiscent of another band I became obsessed with several years ago, Coolrunnings. 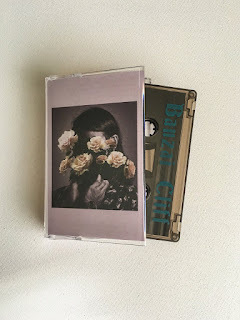 Like that Knoxville band, Banzai Cliff crafts nakedly emotive and taut pop/new wave/alternative hits with minimal personnel and equipment. BC, the duo of Nicky Koch and David Ulrich, also clearly are tuned in to great 1980s coming-of-age movies of the John Hughes, etc., variety, even going so far as to reference “Bill and Ted’s Excellent Adventure” on “There’s Something Afoot” (and of course you add “at the Circle K” to finish the quote, because you’re smart, just like me). Coolrunnings had “San Dimas Oasis,” so maybe there’s another point of connection. But I think what sold me on Banzai Cliff came from this line on “Danielle”: “I lost my virginity listening to Modest Mouse.” Such an eighties line, but such a 1996 reference! (Although current-iteration Modest Mouse can take along walk off a short dock, if you get my drift.) High school senior me would have eaten this up if it were twenty years older, and the reference coupled with the song’s vibe and sound has me wondering if some sort of time-folding event is occurring as I listen. But I don’t think that’s the case. I think Banzai Cliff just knows me somehow, knows me too well, because they did the same stuff and liked the same movies as me. Maybe it’s nothing more complicated than kindred spirits getting what the others are up to.